Recently, photos of Batman on a Japanese highway surfaced. Who was that masked man? People want to know! And through the magic of television, we found out. 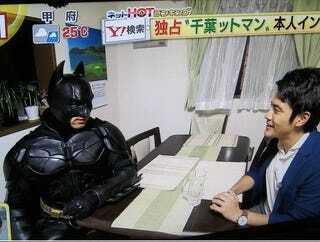 Since this Batman is usually spotted in Chiba Prefecture, he's known as "Chibatman" (千葉ットマン or "Chibattoman"). The 41 year-old Chibatman works as a welder, and his Batman cosplay isn't only a weekend thing. According to Japanese news reports (via Naver and Vipper), he wears his Batman costume when he commutes to work. That's freakin' awesome! The reason why his Batpod, a custom job he made himself, is a trike instead of a two-wheeled bike is that under Japanese law, you don't need to wear a helmet for trikes. They're classified as a type of car. Oh, and it's also legal to wear capes while driving trikes. Here, Chibatman is at home being interviewed. "I do it because I want to see everyone smile," he says. That you've done, Caped Crusader.